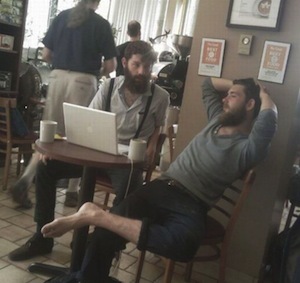 Trending up: Bare footing – Next Hipster Trend is what's HAWT, NEXT! Summer is here, so kick off your shoes! Permanently. People will immediately notice that you’re not wearing any shoes when you saunter into the vegan free-cycling center with your self-harvested dandelion greens. They will ask you almost immediately why you’re not wearing shoes, which you’ll love, because you’ll be able to list about 37 reasons off the top of your head. “Feet that have never worn shoes never exhibit problems such as bunions, corns, and ‘fallen arches’, as well as having a much reduced incidence of problems such as callouses,” you can deliver dryly as you look over the organic fair-trade ilama. “Walking barefoot enables a more natural gait, eliminating the hard heel strike and instead, allowing for a rocking motion of the foot from heel to toe,” you can drone on to the curious shoe-wearing onlookers. Don’t bother with any sort of upkeep down there i.e. clipping your toenails or using a PedEgg . 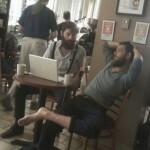 You’ll garner more legitimacy to your claim that you’d “never wear shoes” if your feet appear primal and caveman-esque. Eventually you’ll begin to develop naturally splayed toes, which is Fukushima-hot right now.